Background: Epidermal Growth Factor (EGF) is a well-known mitogen that has importance in cell proliferation and differentiation. This property has led to the common use of EGF as an additive to some cell culture media. EGF has been previously shown to modulate constitutive Cytochrome P450 (CYP) expression in vitro. Objectives: To assess the influence of EGF on the basal and induced expression of CYP3A4, CYP1A2 and CYP2B6 in plated human hepatocytes. Methods: Human hepatocytes were treated with EGF with and without in the presence of positive control inducers. After treatment, CYP isoform mRNA expression and enzyme activity were measured. 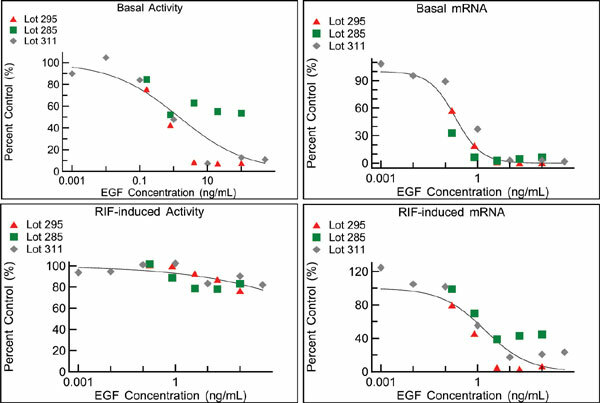 Results: EGF at concentrations ranging from 0.001-500 ng/mL resulted in a concentration-dependent decrease in basal CYP3A4 catalytic activity by up to 92%. In contrast, rifampicin (RIF)-induced activity was decreased only slightly (up to 23%). CYP3A4 mRNA also decreased in an EGF concentrationdependent manner. In contrast to CYP3A4, CYP1A2 and CYP2B6 activity and mRNA were either not suppressed or suppressed to a lower extent. The preferential effect with CYP3A4 was confirmed in 4 additional donors using a single concentration of EGF (10 ng/mL) and time-dependence experiments revealed that suppression appeared after only 24h of treatment. Conclusion: Because of the larger effect on the basal CYP3A4 compared to the induced response, EGF as a media additive enables a higher dynamic range in a CYP3A4 induction assay, potentially expanding the range of donor hepatocytes suitable for use in induction studies. These findings also suggest that EGF may be an important regulator of CYP3A4 expression in vivo. EGF, CYP3A4, mRNA, activity, CYP induction, suppression, human hepatocytes.